2nd Place in Poetry of Art! I'm on a roll for ribbons this month! I know it can't last, so I'm enjoying it while I can! 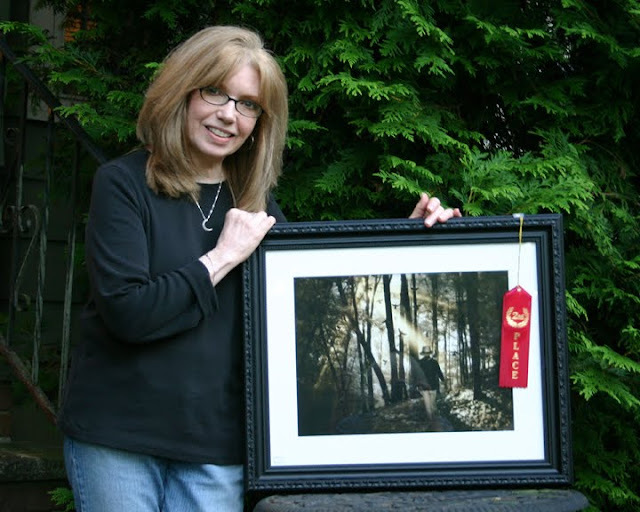 "Miles to Go" took second place in the Poetry of Art exhibit at the Edison Arts Society! 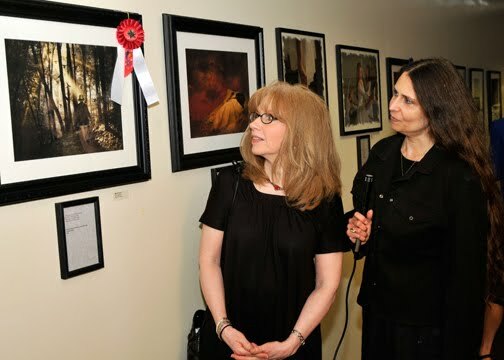 Alan Rosenberg (fellow member and photographer) was nice enough to send me this photo from the opening reception. 2nd Place in Art on the Green! It was a really good day for an art show! Not only was the weather just perfect but I took 2nd place for "Miles to Go"! Yea! Laura Williams ( a wonderful artist, teacher and nice lady) took 1st place for a beautiful portrait painting. Interestingly enough, our spaces were side by side! That's Laura below. All in all, it was a great show- met lots of interesting people and received a lot of nice compliments on my work! Rain, rain, and more rain! 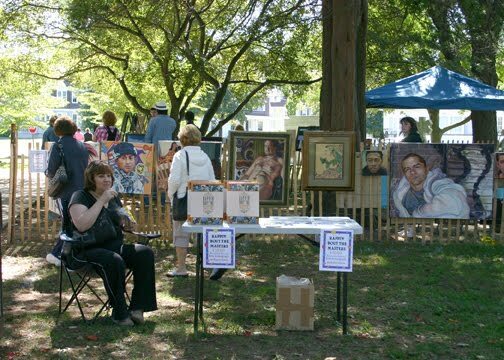 For only the 2nd time in 37 years, "Art on the Green" has had to implement the rain date. It's now scheduled for next Saturday, 9/19/09 (keep your fingers crossed Mother Nature cooperates this time!). Same time, same location (see post below). So if you had plans for today and couldn't make it, here's your second chance! There's always a silver lining! If you're in the New Jersey area, I'll be participating in a small outdoor art show on Saturday, 9/12/09, 10:30 AM to 4:30 PM. 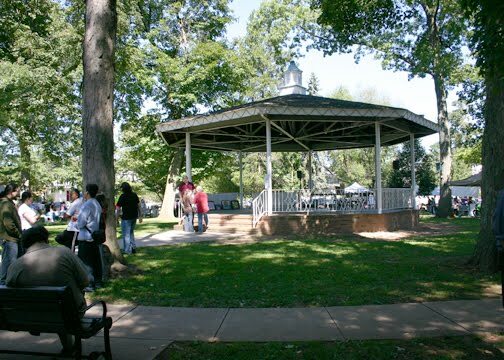 It's a wonderful show held in Washington Park on North Washington Ave. in Dunellen, New Jersey with lots of big trees, gazebos and small town ambiance. 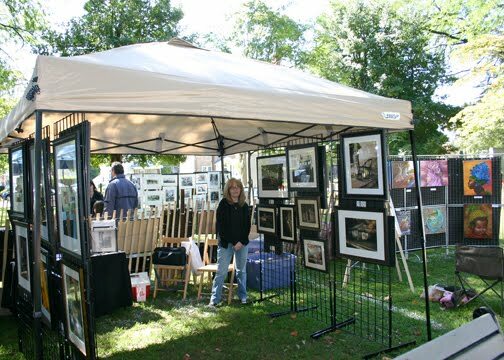 Appropriately titled "Art on the Green", this is the 37th year for the show presented by the local Rotary Club. I've missed being in this show for the last few years, so I'm really looking forward to it. Hopefully, the weather will be nice, but if not, the rain date is 9/19/09. Stop by if you can! I want to thank everyone for the wonderful comments and response to my Empty Easel feature last Wednesday! I was really pleased with Lisa Orgler's review of my work and the opportunity to be a part of the gallery of featured artists! I'm so excited and pleased to be the featured artist on Empty Easel today! If you're not familiar with it, I urge you to check it out. It's a wonderful art blog with a wealth of information for artists and about artists from tutorials to marketing and more! While you're there, sign up for the newsletter to stay informed about articles coming up the next week and think about submitting your own work!